Learn how to wax cheese for long-term storage without needing a fridge! It’s easy to do with these step by step instructions! Buying food in large quantities, or bulk is a great way to save money. Cheese is not something we often think about buying in bulk, but preserving cheese for long-term storage stretches the grocery budget even farther. In my area, cheese goes for $1.89 for an 8-ounce bar or $2.39/lb if you buy it in large horns. As you can see, it’s easily a money save to buy a large wheel. But, how to store over 30 pounds of cheese at once without a special cheese cave or lots of fridge space? You can shred it and freeze it, slice it up and store in the fridge. For those of us without a lot of fridge and freezer space, waxing cheese for long-term storage is a great way to save money on cheese bought in bulk. Waxing store-bought cheese is really fun to do once you try it. First, you start with a hunk or a horn of cheese. Any hard cheese like cheddar, swiss, Munster, or farmer’s cheese will work for this. We have had great results with all of them. Then, slice the cheese into hunks. Meanwhile, melt the cheese wax in a double boiler over medium heat. You can get your cheese wax here. This is the same stuff I used. One note; you will want to use a dish or pot you don’t care about ever using again. The wax is so hard to clean out of it. Trust me on this. Each side got 3 dips total, and I also used a cheese wax brush to make sure that all the holes were filled. The idea is to make sure that no air or light gets to the cheese. After the wax completely cooled and hardened, which took all of 1 minute, I added a label and used the brush to “wax on”. It most important to store waxed cheese in a cool, dry place. I use my upstairs closet right now because the heat in the house doesn’t get up there much and it’s pretty dry. In the summer, I move this to the basement. 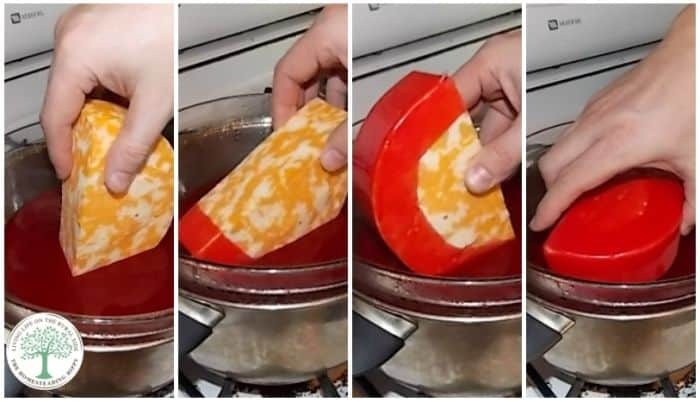 To eat the cheese, simply peel the wax off and enjoy. The wax can be remelted and used again and again. Having been waxed does not change the taste of the cheese to me at all. Some may notice it being a bit “stronger” due to the aging process, but that hasn’t been enough to deter me from waxing it, nor hubby eating it. How long will waxed cheese last? As for how long will waxed cheese last, I have had it stored and tasty for up to 6 months with no problem. You will want to make sure to rotate your cheese to make sure to use the older first. Does waxed cheese need to be refrigerated? It does NOT need to be refrigerated. It CAN be stored on a cool, dry pantry shelf out of direct sunlight. Do I have to use red cheese wax? 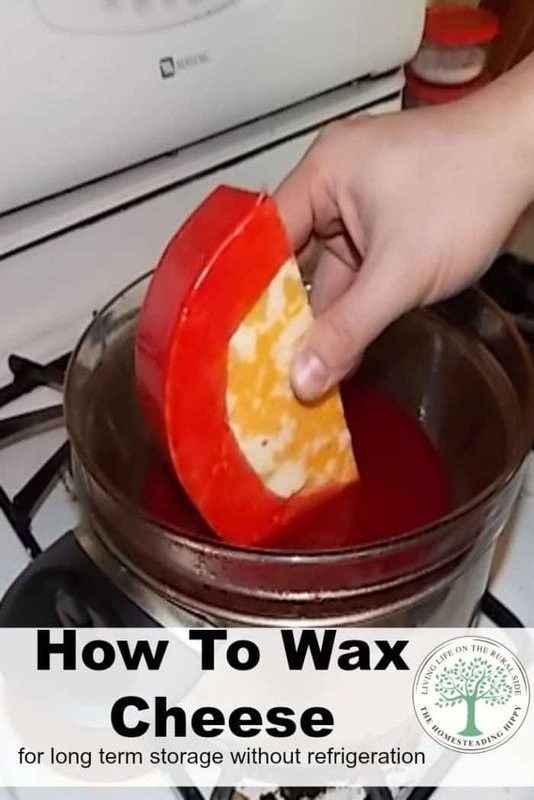 Red cheese wax is a great color to use, but you can also use clear cheese wax or black cheese wax. Maybe mix and match the colors for each type of cheese to make it easier to identify! How do you store bulk bought cheese? 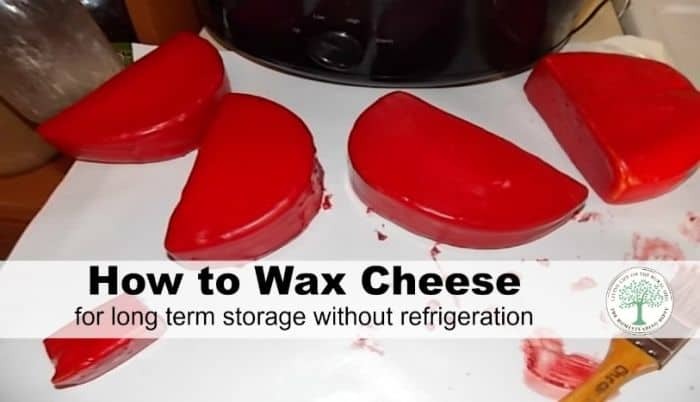 Will you try to wax cheese for long term storage? Be sure to pin this to your favorite board for later! that also means you can send it by mail? How long does the cheese keep in wax? We stored it for 6 months…and not longer because we used it. I have heard ranges from 3 months to a year though. I was interested in waxing cheese for storage a few years ago, but I was told it was not safe due to the risk of botulism. I was also told that today’s cheeses are manufactured to be refrigerated constantly, unlike cheeses of old that were never meant to be refrigerated. that’s interesting…I have never heard that! I’ll have to look deeper into that! I found this on pinterest. I would love to try this. I have a couple of questions. Can any type of cheese be waxed and what’s the longest you’ve ever stored it? Thanks so much. What a great post. Signing up right now for your newsletter. The longest we stored it was 6 months. I have only ever waxed cheddar and colby jack myself, but that’s what my family eats. Have some a little over 3 years old in my basement fridge “cheese cave” where I also hold some of my fermentation projects. I find the flavor does change – for the better. Does the wax need to be colored to block UV or does clear wax work ok? The clear parafine might be a little brittle and prone to cracking if handled. The dedicated use colored waxes may contain plasticizers so it has a little give. Custom calls for cheese style and wax color to be co-ordinated, I guess this is helpful in the market environment. I try to remember to turn the blocks every few months. No spoilage so far after 3 plus years, just really tasty cheese. My gut instinct is that this would be safer with homemade cheese. Commercial cheeses are full of random bs. Tried and true recipes that have been waxed by people throughout history I wouldn’t worry about. But for only three months I this would work. Consider this- there are Cheese that is in the grocery that are waxed. For instance Gouda, Baby bel.